The right makeup brush can make all the difference. I picked both of these up during my recent trip home and I have not gone a single day since without using them. Frankly, I wondered how I've been doing my makeup all along without either one. 1. Hourglass Foundation/Blush Brush No. 2 -I typically like my blush brushes with shorter bristles, but I found this a welcome change. The longer bristles enabled me to get more of a buffing action going when applying my blush. I find it performs exceptionally when used with cream blush and even liquid or cream foundation. The rounded top fits perfectly on the cheekbone and is great for sculpting the face by contouring or applying blush directly onto the cheeks or apples. Typically all my blush brushes are natural hair, but I found the synthetic hair of this brush to be great for picking up just the right amount of product and evenly dispersing it on the skin. I am already a fan of the Hourglass makeup line and this purchase only confirms my suspicions....they are one of the best makeup brands out there today. 2. Sephora Pro Airbrush #55 - This brush has been on my 'must-buy' list for months now. After hearing so many bloggers praise it and reading all the stellar reviews, I had to see what all the buzz was about. After just feeling the brush in the store, I already knew how it would perform. The bristles are incredibly soft and act like an actual airbrush machine to apply the foundation on in the smoothest way. Now that being said, I did find that the only place I had a difficult time using it was around the corners of my nose. For that, I pull out my Real Techniques Buffing Brush which has shorter and stiffer bristles better for cover my pores and blending the foundation in seamlessly. But I don't want that to deter you from the idea that this brush is still UNBELIEVABLE. And this may be a big statement, but it truly has trumped any of my foundation brushes I currently have in my collection. It manages to strike a fine balance between applying foundation so that it looks like second skin but still allowing the coverage of the makeup to come through. It is by far one of the most unique brushes I have ever owned and I am already contemplating buying a back up. 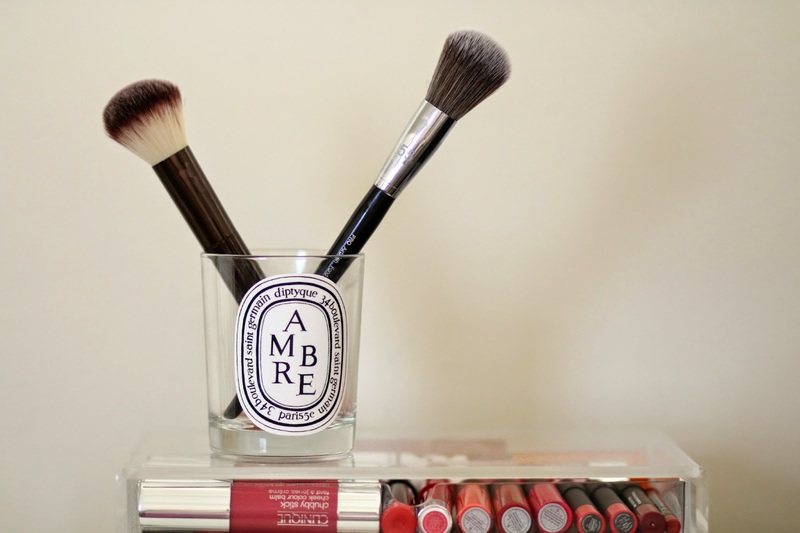 What is one of your favorite foundation and/or blush brushes? Everyone's been raving about the Sephora Pro line - I really want to try them! They sound like such amazing brushes. I've only tried this one so far but it was amazing so I now want to try the other ones!